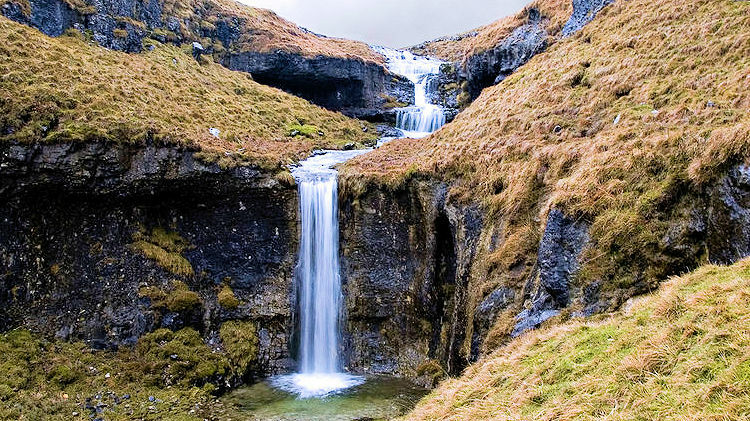 The geology of the Yorkshire Dales is perfect for supporting waterfalls. The unique landscape is a result of the area's geololical history with much of the Yorkshire Dales National Park covered in carboniferous limestone which is interspersed with shales, gritstones and sandstones. 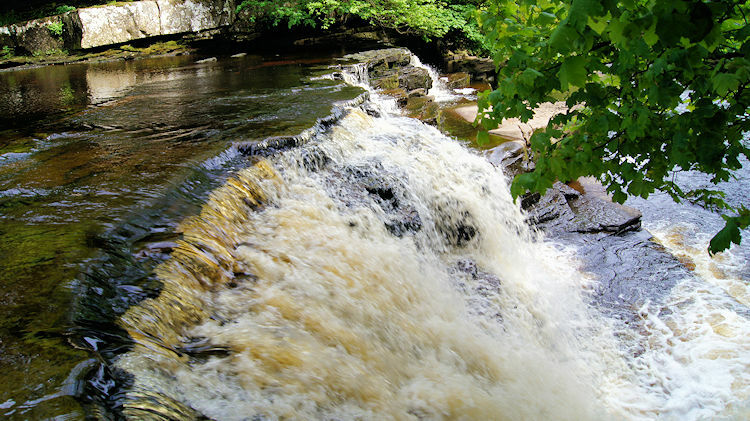 Natural landshift which created the topography of the area during the great ice age and subsequent erosion of the softer stones has caused rivers and becks to form waterfalls all over the dales. Some are little more than a few inches high, many less than the height of an adult person. Yet there are many spectacular waterfalls to be found. 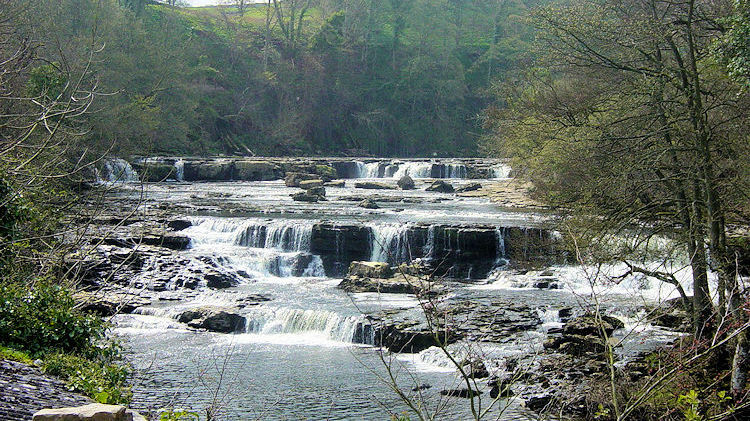 Some are solitary like Hardraw Force, the highest of them all and some part of a series of cascades like the ones at Aysgarth Falls. In this section I present 32 of my favourites. These are from my personal experiences while walking in the Yorkshire Dales. With each description I provide their source and the river those first trickles flow into with details on how to get to them when walking. This includes a precise OS map reference. 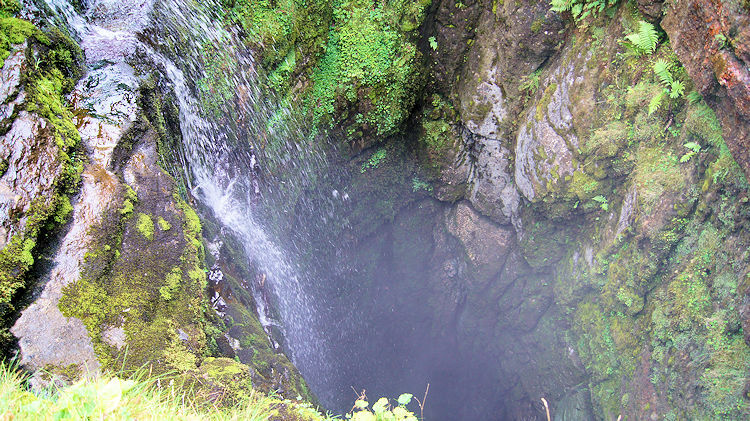 You must try to visit some of them on your next walking expedition into the Yorkshire Dales. 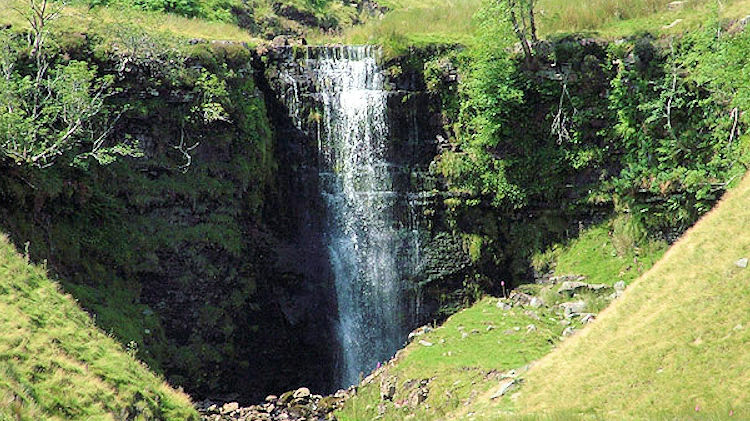 Aysgill Force is a 40ft waterfall in Duerley Beck which, should conditions be right, offers a spectacular view for walkers who make the short journey south from Wensleydale into Sleddale. 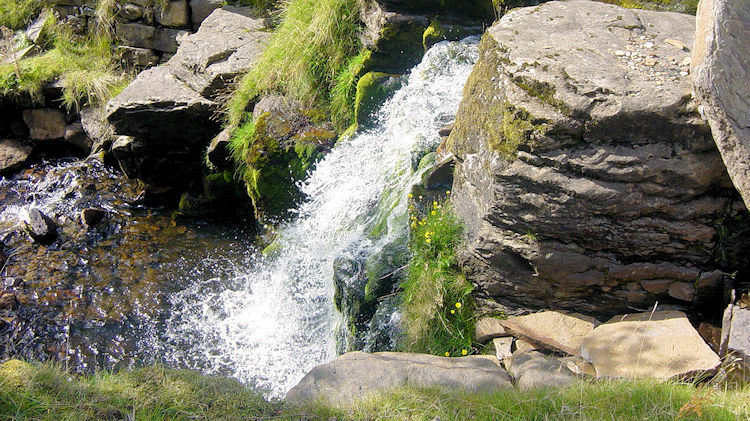 The walk is along the beck from Hawes and through Gayle to the waterfall. A return route is found a little higher to the west making for a short circular walk. Clapham Falls are located in the north of the village and fall just after Clapham Lake. They are clearly be seen from the road by walkers leaving Clapham who are bound for Ingleborough via Ingleborough Cave and Trow Gill but you will have to look over to your right if the weather is set fair for only in wet conditions can their roar by heard to catch your ear and turn your head. 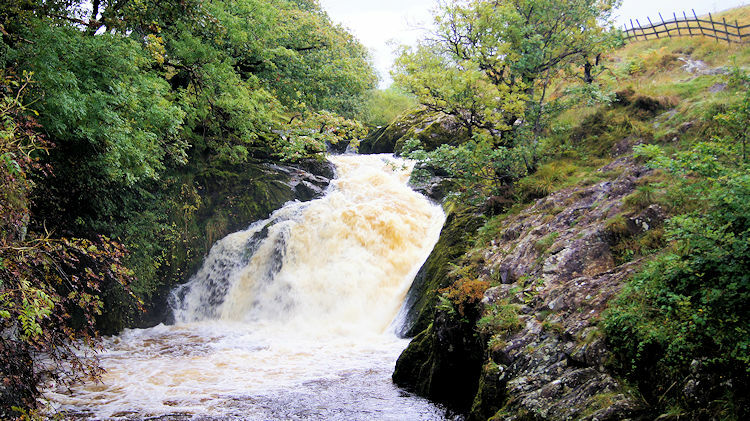 There are lots more opportunities to see smaller falls in the beck further upstream. 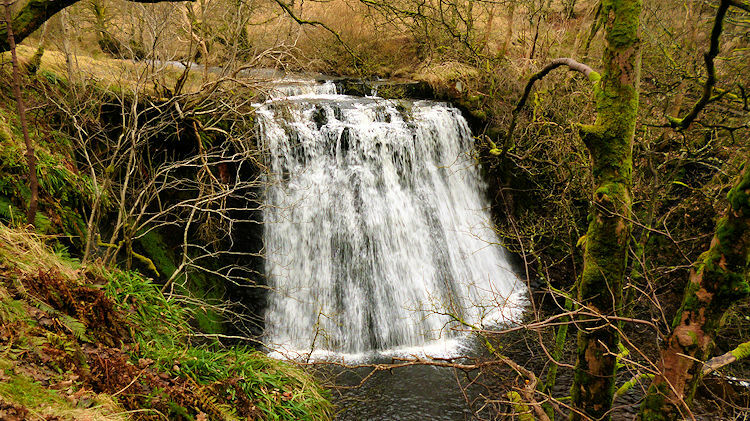 I have been to East Gill Waterfall a few times. The first time was during the Coast to Coast Walk in 1994. 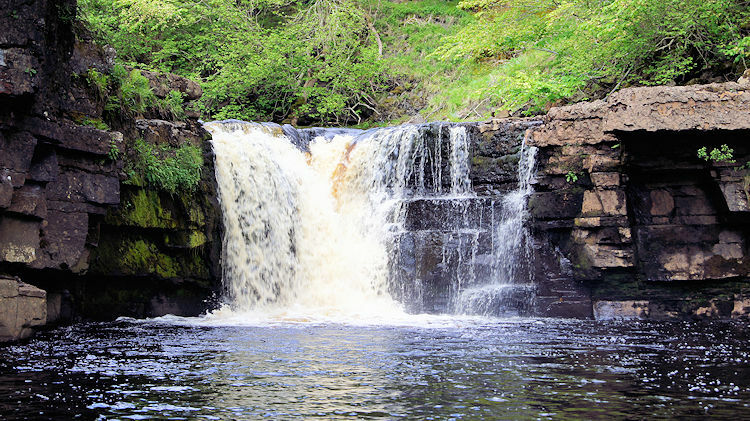 It left such an impression that I have revisited it on most of the occasions I have walked nearby as there is easy access from a path from the bottom of Keld village. 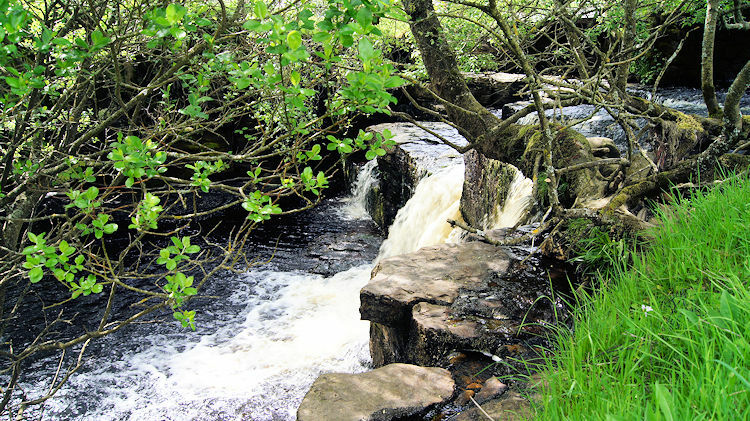 The waterfall is a popular picnic spot for families because of its close proximity to the roadside thus making the walk not too difficult for children the elderly. A lovely waterfall it is too. Try this walk. 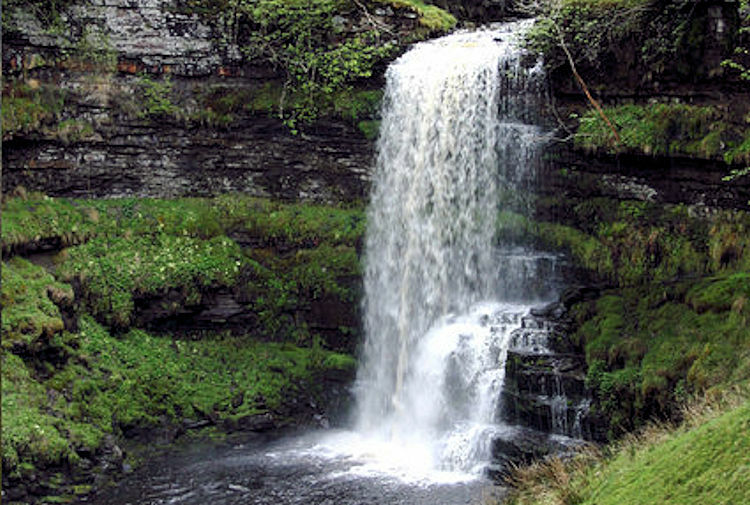 Force Gill Waterfall has been seen more times than most in the Yorkshire Dales yet seldom visited. This is because it is close to the Three Peaks Walk between Ribblehead Viaduct and Whernside, a tough uphill section where most people are more concerned with simply getting to the top. 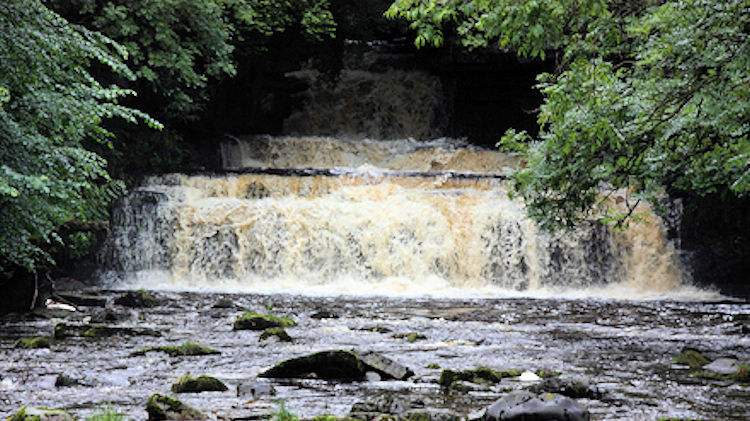 That's a shame for the waterfall with its 6 metre verticle drop is one of the best of all in the dales. Being close to the path it is easily reached by a short detour. Try this walk. Gordale Scar is a very popular place and you will often find people attempting to clamber up the lower of the two waterfalls in the scar. The area around Gordale and Malham is the most visited area in the entire park so don't expect to be alone if you visit. 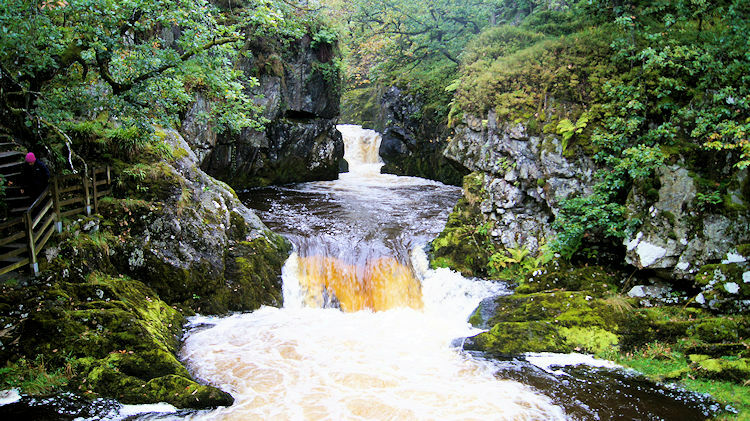 The reasons for the scar's popularity are evident as you round the gorge to the scar from Gordale Bridge. It is one of those awesome sights you will never forget. An inspiring place to be. Try this walk. 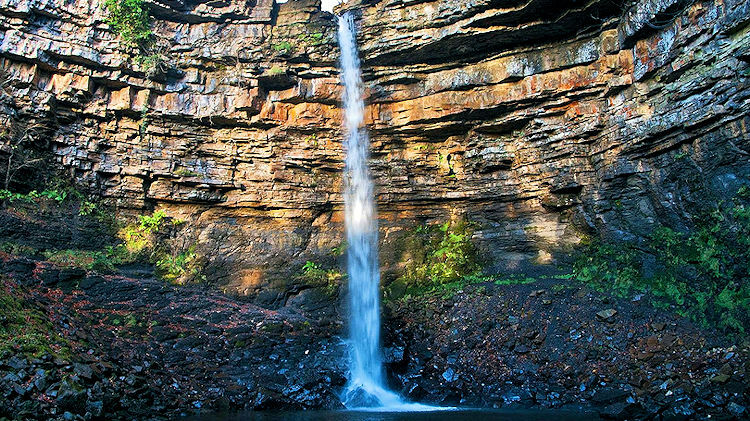 The largest of all in terms of single drop and reputedly the biggest in England Hardraw Force is also famous for being the location of Kevin Costner's bathe in Robin Hood - Prince of Thieves. Hardraw Force plunges water from Hardraw Beck over 30 metres over a rocky overhang. 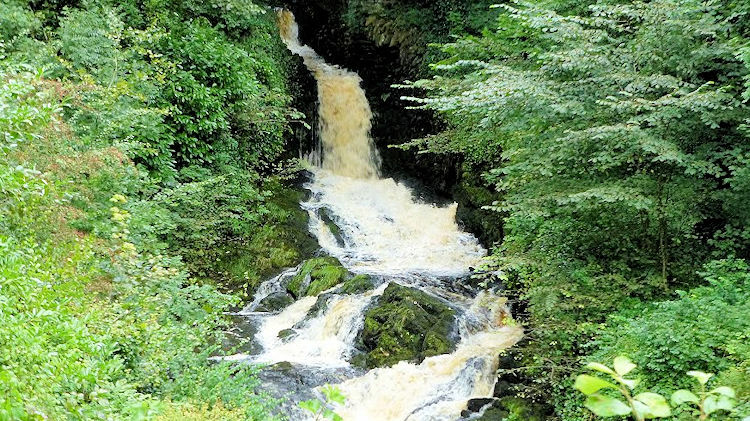 Hidden in a copse the waterfall is only accessible via the Green Dragon pub in Hardraw for a small entrance fee. 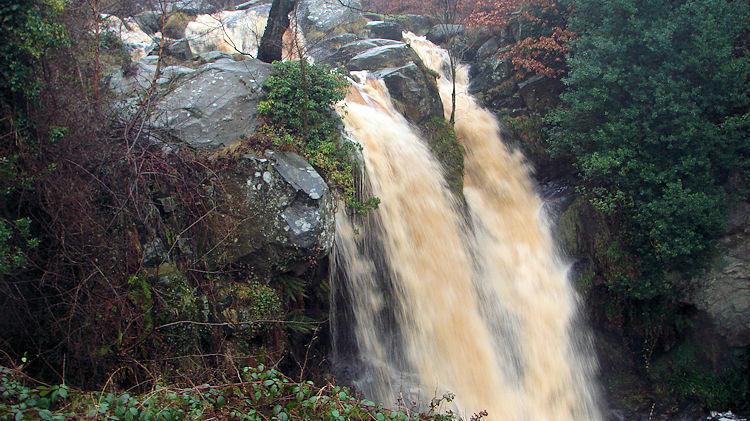 Take note - the waterfall can be a trickle in dry weather. Try this walk. 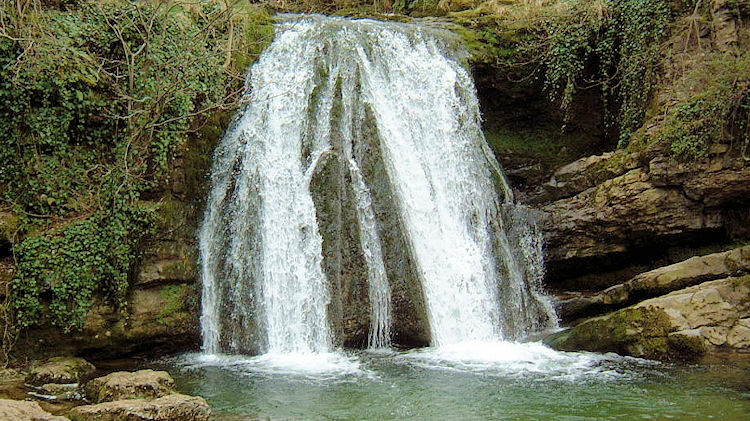 The small waterfall of Janet's Foss is a popular place for families to visit as it is conveniently situated next to the roadside between Malham and Gordale Bridge. In past times the pool below the waterfall was a sheepwash for local hill farmers. A good spot too, on the road to market to get the sheep looking their best. 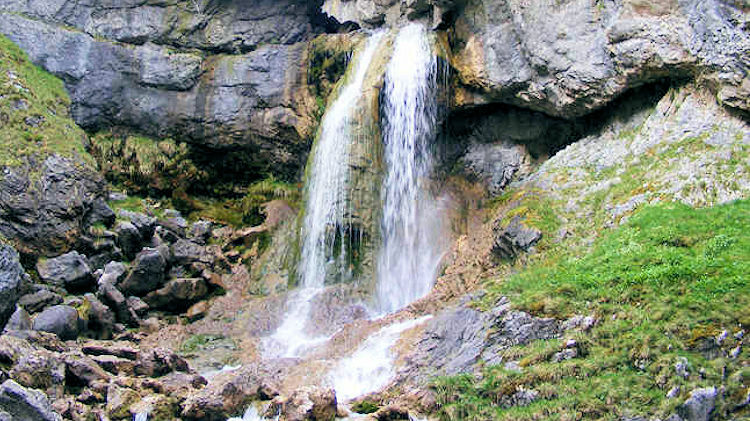 The Foss is a single drop waterfall of about 4 metres. Oh, Janet was a local fairy who lived in a cave behind the waterfall. Really! Try this walk. 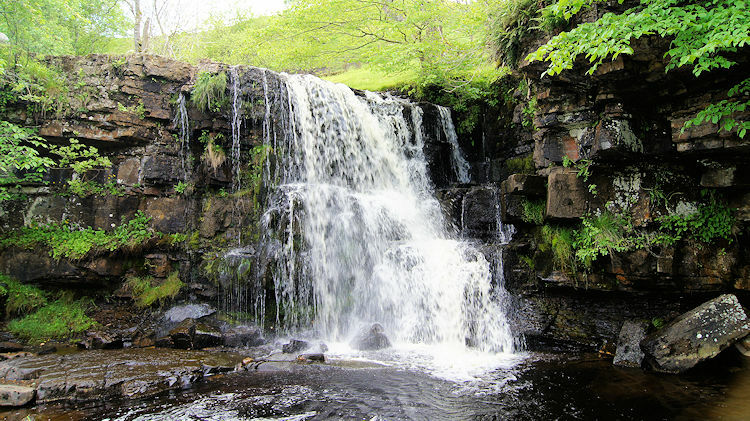 The Kisdon Force series of waterfalls are located 600 metres downstream of Keld village. 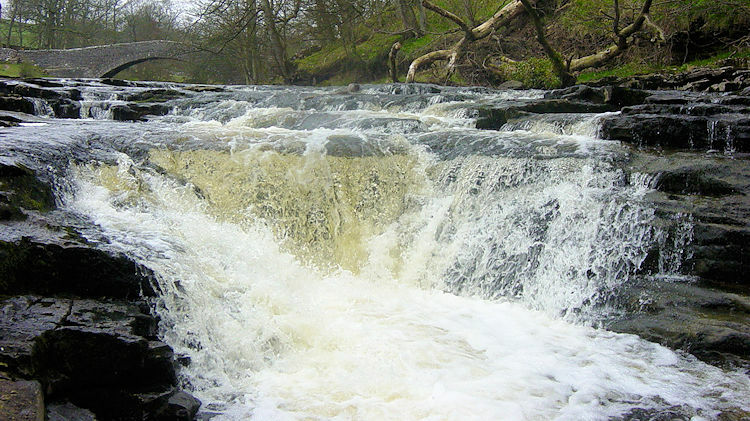 This is a particularly aggresive part of the river as there are a number of other falls in the vicinity. 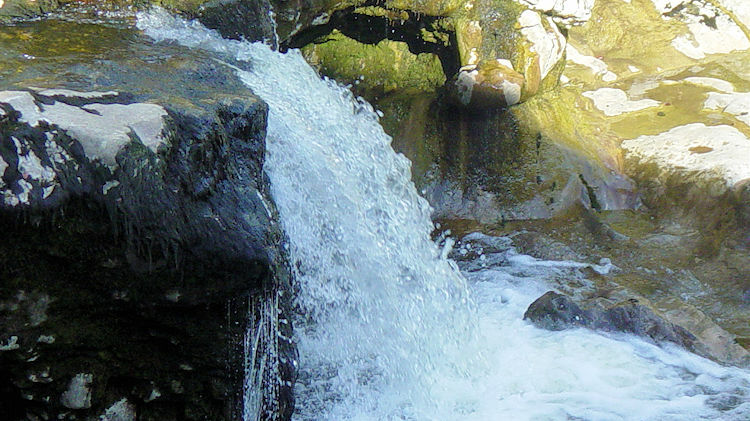 None of the falls are dramatic drops but a cascading series popular with canoeists. 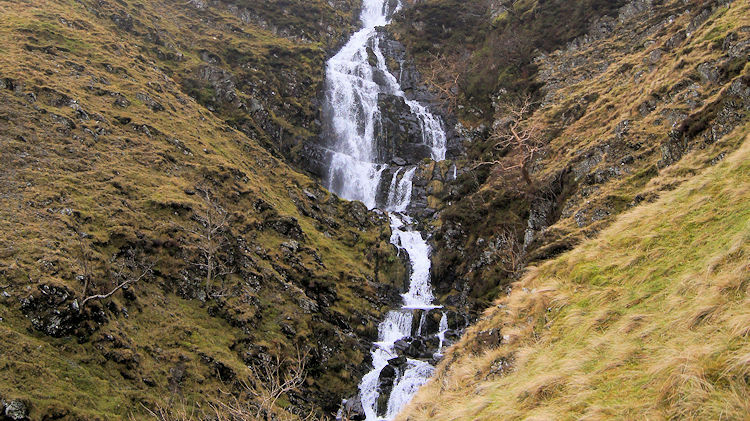 This is an set of waterfalls of which I have special memories as I met a litter of stoats walking down to them once. 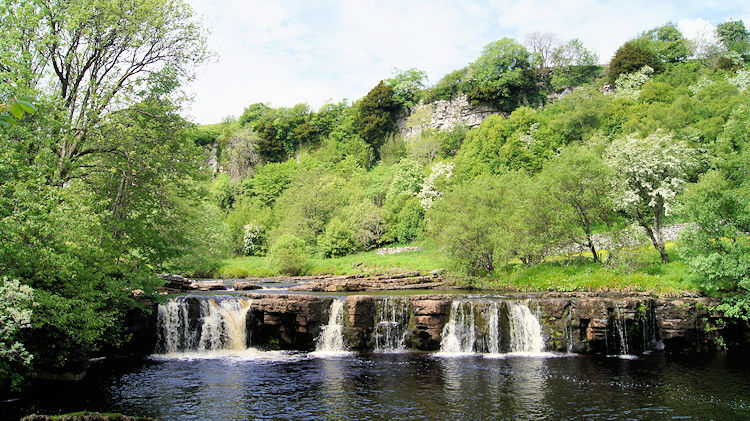 They are easily reached on a riverside path from Keld. Try this walk. Linton Falls are in one of those places that attracts gosts of visitors. 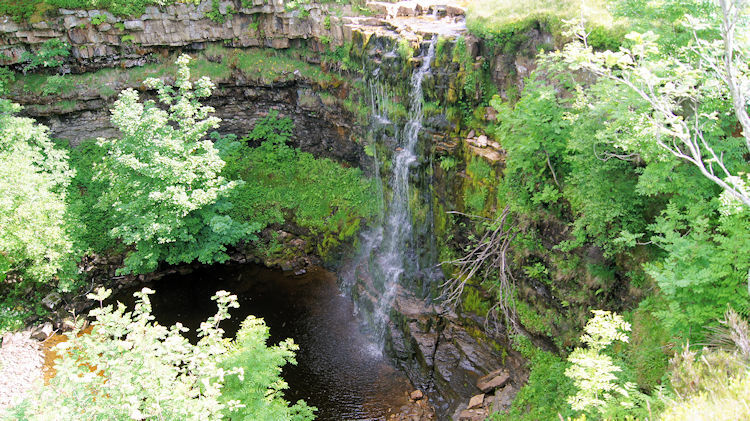 The falls are located just south of Grassington in Wharfedale and can be easily walked to from this most popular village by a short stroll down Sebber Lane. There is a footbridge straddling the falls so viewing their beauty is exceptionally easy. The north bank of the river is always busy with families on a pleasant summers day as the gentle grassy area makes a splendid picnic spot. Try this walk. 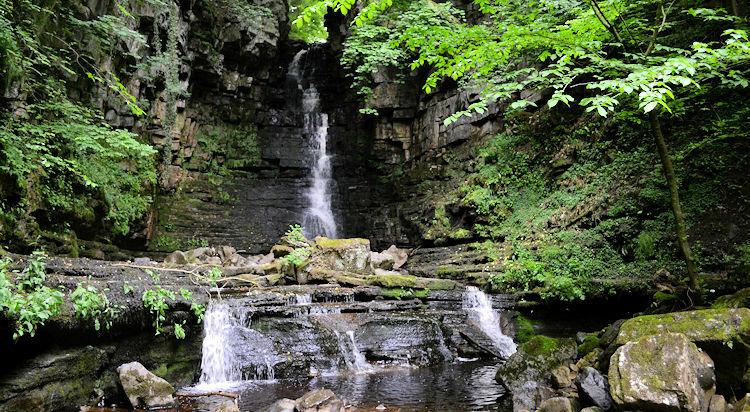 Mill Gill near Askrigg in Wensleydale has a number of waterfalls along its short routebetween Whitfield Beck and Paddock Beck en route into the River Ure. The Force is hidden in woodland 1km west of Askrigg and can be reached by following a road west from the village before crossing a field and then walking in the wood alongside the Gill. 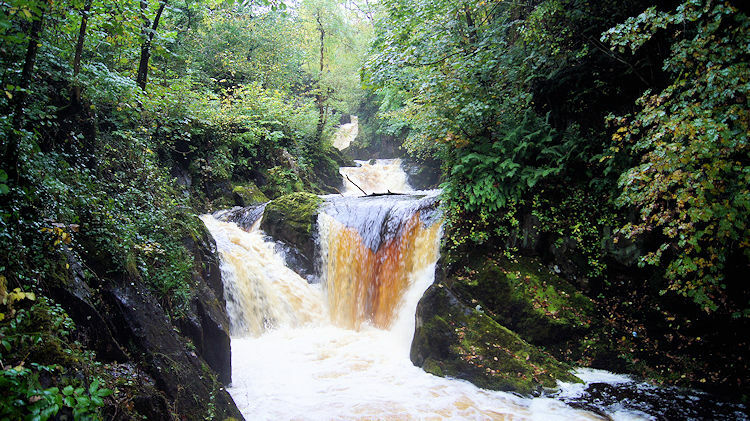 The Force is best visited in a double adventure by also visiting Whitfield Gill Force (see below). Try this walk. 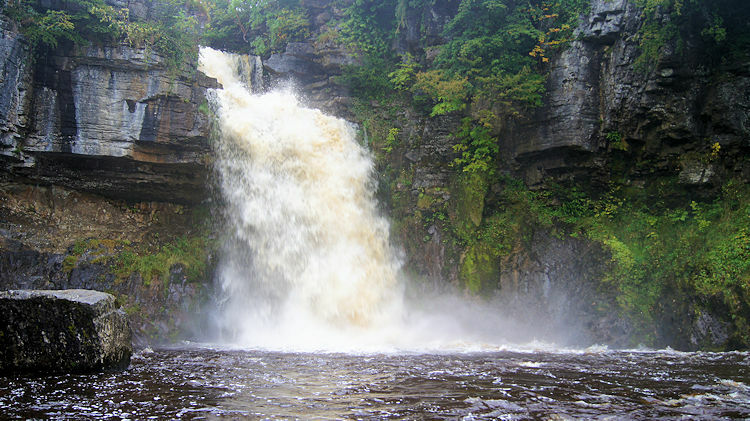 Posforth Gill takes water from Barden Fell to the River Wharfe via the Valley of Desolation. This is a popular walking area for it is the closest part of the dales to the conurbations of West Yorkshire. I have walked from Bolton Abbey through the valley onto Barden Fell and across to Simon's Seat many times and often stayed by the falls. 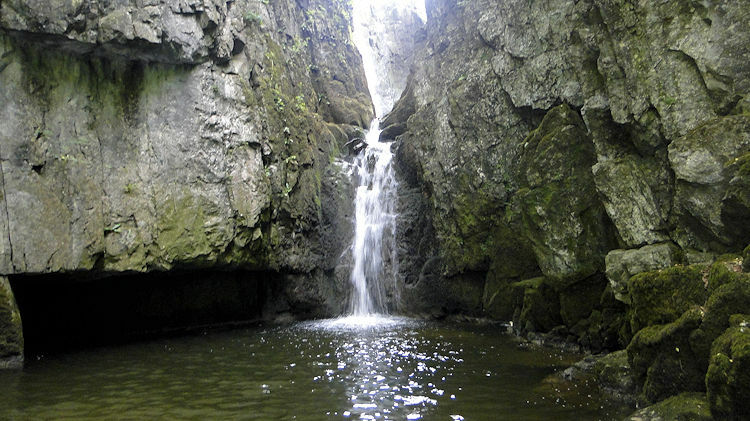 Incidentally there is another secluded unnamed waterfall further up the valley at SE081569 that deserves a visit. Try this walk. Embsay Moor in the south east of the Yorkshire Dales is a wide open expanse, much of it featureless. However it holds some interest for walkers like Rylstone Cross and Cracoe War Memorial. Water bleeds off the fell rather than flows as most is captured by the Barden reservoirs and transported off the moor in underground pipes. 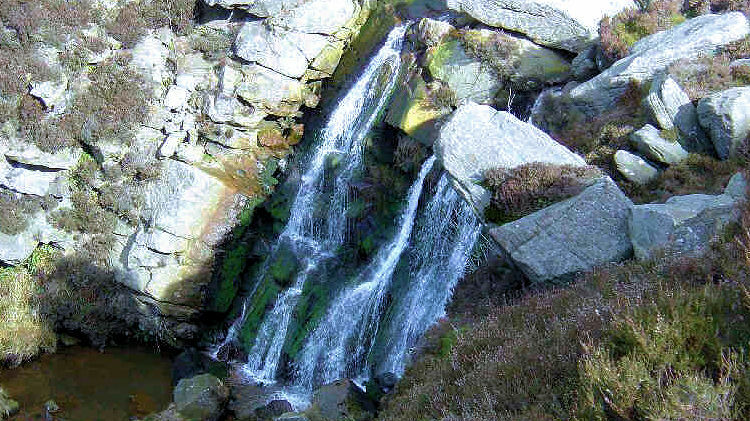 Thus the waterfall at Waterfall Gill is a delightful exception and although small it is a lovely spot on a barren moor. Try this walk. 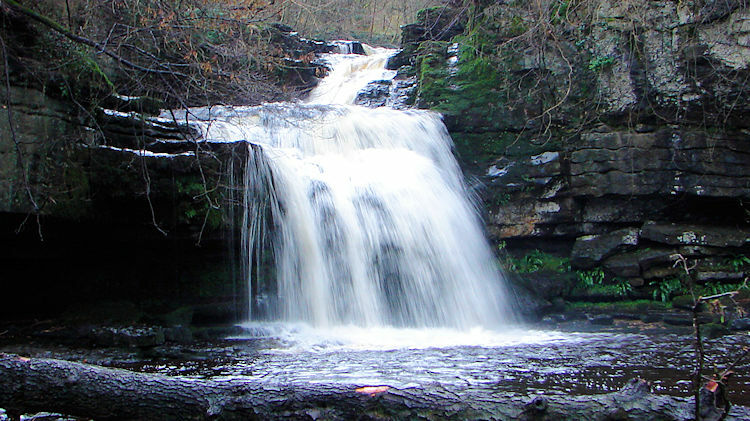 West Burton Falls (also known locally as Cauldron Falls) are easily reached by walking to the north end of the village and standing on the footbridge. The path that leads off from the footbridge into the country takes one closer to the falls but they are secluded by woods after a while. 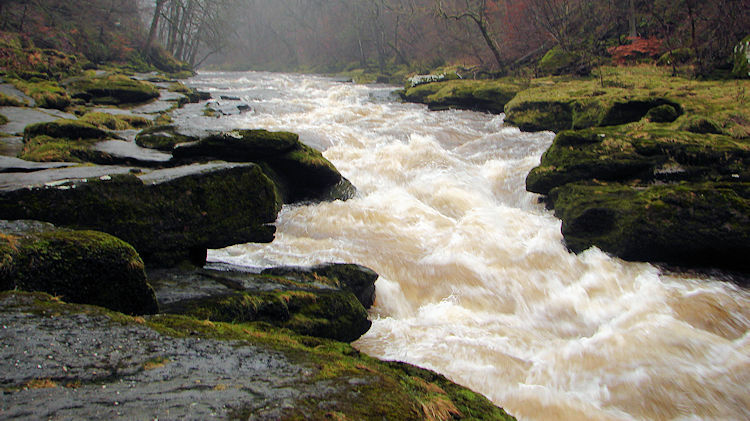 The falls are often benign and only reach the force shown in the picture after substantial rainfall. There are many walks to enjoy around West Burton. Try this walk.